This is the story of David Huggins who has had lifetime of interacting, sometimes sexually, with alien visitors as told to us by the man himself. I'm kind of bemused by this film. It is not that there is anything wrong with the film, there isn't. Rather that with all of the stories of contact between earthlings and extraterrestrials way this one is getting noticed is beyond me. I suspect that the fact that the film isn't overdone and simply lets Huggins tell his story is part of the reason. I also suspect that the film isn't as crudely made as many direct to home video or You Tube films are helped it score an audience. 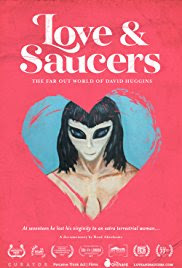 How you react to LOVE AND SAUCERS is going to depend on if you've some in contact with stories of alien abduction before and if you have a reasonably open mind. If you completely dismiss the possibility of intergalactic contact just pass this by because the film is going to be a yuck fest. Huggins is going to come off as daft and you're going to hate the film. If you are at least open to the possibility that there could be something to the story then you will find it engaging. As someone who has been down the rabbit hole and built an extension for a portion of my book and film collection I found the film to be good but nothing new. I've heard any number of similar stories over the years and while I've no idea if any of them are true they raise interesting question if they are. Is the film worth seeing yes it is. Its a very good look, for better or worse at something the vast majority of people don't seriously consider. Its a well done film on a fringe subject that will get your grey cells going and more than likely get you talking about it afterward. LOVE AND SAUCERS will be available for streaming tomorrow.